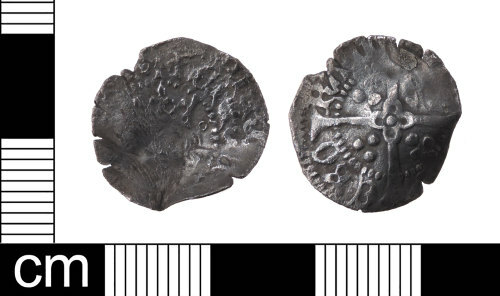 A silver Medieval penny of Henry V, Class C dating AD 1413-1422. Mint of York. The obverse has been double struck. North 1400. Obverse: Crowned bust of the king facing, broken annulet to right of crown. Reverse: Long cross dividing the inscription with three pellets in each quadrant. Quatrefoil in centre. Dimensions: diameter: 16.63mm; weight: 0.64g. Obverse description: Crowned bust of the king facing, broken annulet to right of crown. Reverse description: Long cross dividing the inscription with three pellets in each quadrant. Quatrefoil in centre.